Deadlines, I don't know about everyone else, but this is one word that I am not too fond of. From school to appointment with friends, to writing articles here on APH Networks, it is nothing short of hard to be able to meet them all. (I'm sure our Editor-in-Chief Jonathan would have a few things to say about that, haha.) To say being able to juggle time properly is hard would be quite the understatement. However, there are a few things that can be done to make time management a bit more bearable. One way is to use a calendar to mark down your events and deadlines, and lay them all out visually. The thing is, these days, it may seem a little old fashioned -- got to get with the times, man. From using our cell phones with integrated calendar management to the software we will take a look at today, we can make schedule management better than before by electronic means. What we are looking at today is a copy of Rainlendar2 Pro, the paid version of a very popular program known for its simple interface and lightweight operation. In this report, we will dig deeper into this software, and analyze both the basic and Pro version features. So without further interruptions, let's move on to our report! Rainlendar2 (The free version) is a calendar software I have used for quite some time now. It is very useful for keeping track of tasks, events, and planning out your schedule, especially if you are in front of the computer a lot. 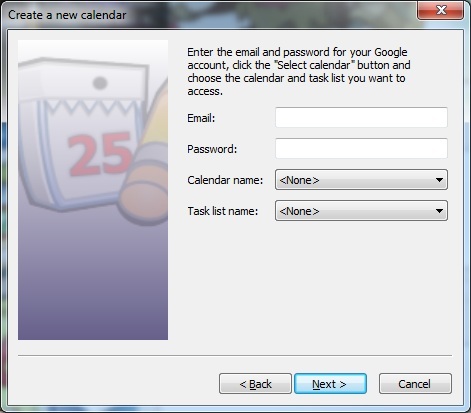 The biggest draw of the Pro version is the ability to sync the calendar in a variety of different ways, instead of having entries limited to each computer locally. In this report, I will go through most of the basic features, which are available in both versions, and more in depth into what the Pro version tacks on. The software itself consists of three main detachable components: the Upcoming Events list, To Do list, and of course, the calendar itself. These features are available in both the free and the Pro version of Rainlendar2. Starting with the events list, it displays the upcoming events you have set on your calendar; by default the next six entries will be displayed. More events can be displayed by changing the settings in user options, which we will take a look at later on. When it comes to the To Do list, it is just a list of tasks one chooses to create. There are various ways to organize the tasks, including alphabetical, categorical, priority, and so on. Right clicking on any tasks also gives additional options, such as setting the status as a percentage in 10% increments. Completing a task adds a distinction on the task, which can be as simple as an arrow, different color, or in my case, a strikeout. These are defined by the skin used, so we will make it another topic we will cover in this report in just a moment. Obviously, one of the most important parts of calendar software nowadays is the calendar itself. I personally use it daily on my smartphone to keep track of my events as a university student. Regardless of usage, Rainlendar provides an easy way to create events. First, the events tab is used to summarize the event, set the location, add a URL if applicable, and the start and end time. Comments can also be added at the bottom textbox, calendar to add the event to, and the entry category. Next, there is a recurrence tab that allows one to set a number of repeats for once every few days, weeks, months, and years. It can be set to run for a certain number of times until a certain date, or forever if it is your preference. Exception date can also be added; they are selected from a dropdown calendar or by manually typing in parts of the date. Overall, the process for creating events is short and sweet as needed to be efficient and effective even for first time users. After taking a look at the basic features, we will now take a look at some of the options available in Rainlendar2. The options window has five tabs on the left, listed in order they are as follows: General, Calendars, Skins, Hotkeys, and Advanced. Starting with the General section, this screen is pretty simple with just a few options. These include setting the start day of the week, configuring whether to enable on startup, or to lock the windows in place. The bottom half of the General tab is mostly for positioning and the visuals. The position can be set to be on top, normal, bottom, or desktop. Next to that is the opacity of the windows in normal mode and when it is hovered over. The next two tabs, Calendars and Skins, will be talked about in the following section, so let's just move onto Hotkeys for now. Hotkeys can be created for several options, including backup, creating events, creating tasks, refresh, and a few other navigation options such as selecting the next and previous months. For setting the shortcut, it must use at least two keyboard keys including any combination of ‘ctrl’, ‘shift’, or ‘alt’. Lastly, the Advanced tab is one of the most important. This is where most settings can be set, including options for the task and events lists. Here, you can set the number of events or tasks to display, whether to show the times for events, display when a task is due, and so on. When it comes to customization, Rainlendar2 is definitely top notch. The Skins tab gives access to a whole range of skins that can be found online. It even includes a few default skins. Currently, the Chromophore skin was used in the screenshots shownt. This is one of the key features when it comes to Rainlendar2 over to its competition, with a range of skins that are so vast, there are various websites dedicate solely just for Rainlendar2 skins. Each skin chosen here will affect each individual module, which includes the calendar, Event list, and To Do list. The top part displays the different skins; a small description and preview is given in a small box below. There are two buttons between the available skins and details -- Categories and Advanced. The Categories button leads to another window, where you can add, remove, and edit different categories. Icons can be set on each one, and will be displayed on the calendar. These categories can be something as simple as birthdays to urgent events. Onto the Advanced button, with this pressed down, it allows you to choose different skins for different widgets such as tooltips, alarms, calendars, event lists, and the other assorted windows. 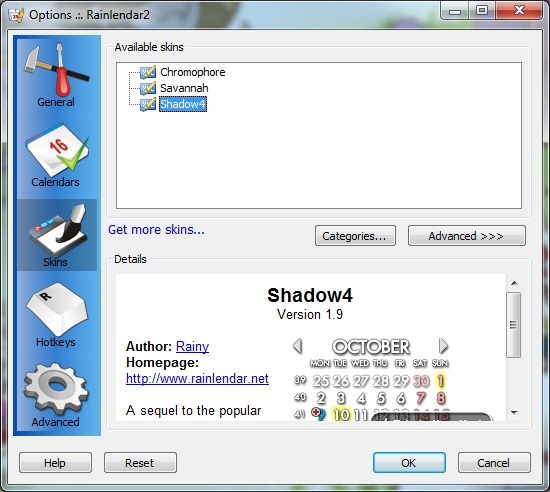 This means it is possible to mix and match different skins for assorted parts of Rainlendar2. 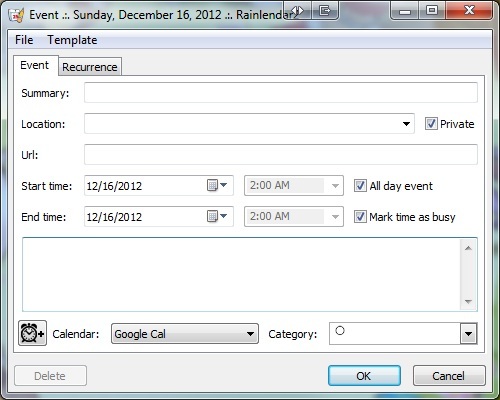 Calendar management is an important part to Rainlendar2, and has many different features for each one. From the Calendar tab, you are able to add, remove, and duplicate calendars using the buttons. You can even configure the priority of calendars. Below that, various settings for the selected calendar can be changed. These include whether to enable or disable current selection, turn the alarm/notifications on and off, and time offset for events -- if necessary -- to deal with time zone differences. 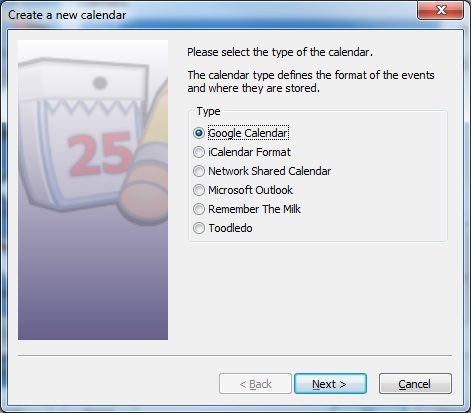 Rainlendar2 allows for six different types of calendars that can be used with the Pro version of the software, in order from top to bottom, they are: Google Calendar, iCalendar Format, Network Shared Calendar, Microsoft Outlook, Remember the Milk, and Toodledo, as shown in our screenshot above. Google Calendar is probably the most common one, and will be looked at in a more thorough manner in a separate section. iCalendar is a file format for keeping schedules and calendars; this is not to be confused with Apples previously named iCal. iCalendar files can be imported and used with Rainlendar. Network Shared Calendars are also supported, which means one can have an external server to store their calendar and events. Microsoft Outlook calendars can also be imported and used with this software. Remember the Milk is a popular task scheduling program that can be used on mobile phones and online. Toodledo is a competitor to Remember the Milk, and is also used to schedule tasks and events. All of the above are well supported in the Pro version of Rainlendar, and makes a good case for upgrading in my opinion. Google Calendar is one of the most used calendar software in the world, thanks in big part to Google's reach in both the mobile and the online market. Setting up Google Calendar with Rainlendar is easy. After selecting Google Calendar, we are treated with a screen that asks for our email and password. When your login credentials are verified, the calendar and task list name can be entered. After both of these are selected Rainlendar2 , it will automatically sync with the chosen Google Calendar. This is probably the biggest draw for me in terms of the Pro version, since I use an Android phone. Our Editor-in-Chief has an iPhone 5, which works just as well. This means anything I set in Rainlendar will automatically be sent to my phone, and vice versa. All of your past events are added by default, however it is possible to just display events from a certain date. This syncing of calendars is really a great thing for those who want one unified calendar across all their devices, whether it be there desktop, laptop, smartphone, or all. If there was one reason to just pick up the Pro version, this could easily be it. 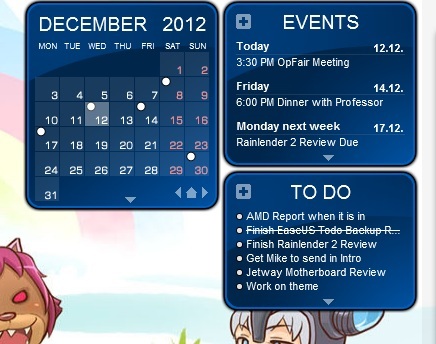 Rainlendar2 Pro is a fully functional and easy to use calendar with tons of customization features. With a lot of themes to choose from, you can even mix and match parts from different designs into one. There are many ways to customize Rainlendar2 Pro to suit your personality, and this is awesome. With the inclusion of online calendar syncing is definitely a selling point for the Pro version in my opinion. From network calendars to more popular task planning apps such as Remember the Milk and Toodledo, I think the price you pay is well justied. This is especially true with Google Calendar support, since it can be used in many different mediums ranging from cell phones, tablets, to even other computer with web access. Having your calendar and schedule with you everywhere is a great way to make sure your life is as organized as possible. If you are looking for a simple, lightweight, and powerful calendar app that can sync with virtually everything, Rainlendar2 Pro can keep you on top of things at a bargain. Rainlendar provided this software package to APH Networks to facilitate this report. Rainlendar2 Pro is an excellent all-in-one calendar and scheduling software with premium features such as syncing for only €9.95 EUR (Approximately $13 USD) at time of writing. Do you have any comments or questions about the Rainlendar2 Pro? Drop by our Forums. Registration is free, and it only takes a minute! Are you interested in a backpack with a solar panel? posted 1 day and 0 hour ago, with 6 posts. posted 1 day and 0 hour ago, with 5 posts. posted 1 day and 0 hour ago, with 13 posts. posted 1 day and 0 hour ago, with 57 posts. posted 1 day and 0 hour ago, with 12 posts. Learn how to make a website and other useful tips at Metapress. "APH Networks", "Independent and Influential", © 2005-2019 APH Networks Inc., all rights reserved.